When you’re dropping a grand or thereabouts on a Christmas gift, you’d better be damn sure you’re buying the right present for the right person. Otherwise, you’ll be staring down the barrel of a rather pricey mistake – and they’ll be returning your gift and embarking on a January sales mega spree. Wahoo! T3 has extensive experience when it comes to choosing premium tech gifts, which is why we have pulled together this glorious list of opulent gadget buys for £1,000 and under. Will X mark the spot for your ideal Christmas present? Have you been good this year? Then Santa may just bring you one of 2017’s most hotly-anticipated (and exuberantly priced) smartphones, the Apple iPhone X.
Apple’s stunning 10th anniversary edition handset features a full-glass front and dazzling 5.8-inch OLED display, with support for HDR10 and Dolby Vision. There’s a powerful facial recognition system, with Face ID instead of Touch ID, and a new dual camera with True Tone and OIS on both cameras. The front and rear cameras have Portrait Mode, which is good news for your Christmas selfies and group shots. Trust us, Apple fans hoping to snag one of the brand’s most coveted products will love this gift. Write on it, draw on it, read on it, watch movies and take photos on it… The versatile Samsung Galaxy Tab S3 with S Pen is perfect for throwing in your bag for working and playing on the go as well as at home. You’ll love watching films and surfing the net on the Tab S3’s 9.7-inch Super AMOLED display, with HDR video delivering an immersive viewing experience beefed up by the sound of quad-speakers tuned by AKG. Forgot to charge your Tab S3 again? Luckily there’s Adaptive Fast Charging functionality here to get you up to full speed - 12 hours’ playback - in under three hours. Need to do the Christmas Skype rounds? Get on it knowing you’ll look your best with the Galaxy Tab S3’s 5MP front-facing camera. There’s a 13MP at the rear for snapping stills and recording festive home videos. The Beatles will never lose their cool, making this affordable luxury timepiece from Swiss watchmaker Raymond Weil the ideal wrist-based investment for music fans. A limited edition design, the Raymond Weil Watch Maestro Beatles 2017 is a limited to only 3,000 pieces, making it a real collectors item. It’s designed with a durable stainless steel strap and a slew of gorgeous, Fab Four motifs. We love the vinyl-style watch face, the nod to Abbey Road-era Beatles between the 3 and 5 position, and, of course, The Beatles iconic logo up front and centre. The watch comes packaged in an opulent box with display base. Fire up the Christmas party playlist! Wake up the neighbourhood with Naim’s high-end, mid-sized wireless speaker, designed to fill your room with a powerful, bass-rich sound. The Mu-so Qb is perfect for soundtracking your Christmas and New Year’s Eve parties and uses DSP (digital sound processing) to maintain the best sound quality at any volume. The cube-shaped speaker can be paired (via Bluetooth) with your smartphone or tablet to pump out your favourite playlists. There’s also built-in Spotify Connect and Tidal support, and a USB port and 3.5mm analogue input for connecting music players. Naim’s multi-room ready Mu-so Qb will look stunning at your party, too, with its brushed steel top and cloth Speaker Grille, available in a range of colours including Vibrant Red and Deep Blue. Photograph more of the world around you this Christmas, and less of your mum’s Boxing Day turkey buffet, with the stylish Pentax KP. Compact and relatively lightweight, this digital SLR camera is brimming with features to elevate your photography. Thanks to its adverse weather-resistant casing, the Pentax KP can be used outdoors throughout the winter. The camera places impressive imaging power at your fingertips, too, with 24.3MP, a broad sensitivity range and an advanced AF system. Second-generation Shake Reduction tech should keep it on the right track in subpar conditions. Foodies rejoice! KitchenAid recently unveiled a new limited edition version of its Artisan stand mixer and it’s everything you’re looking for this Christmas. 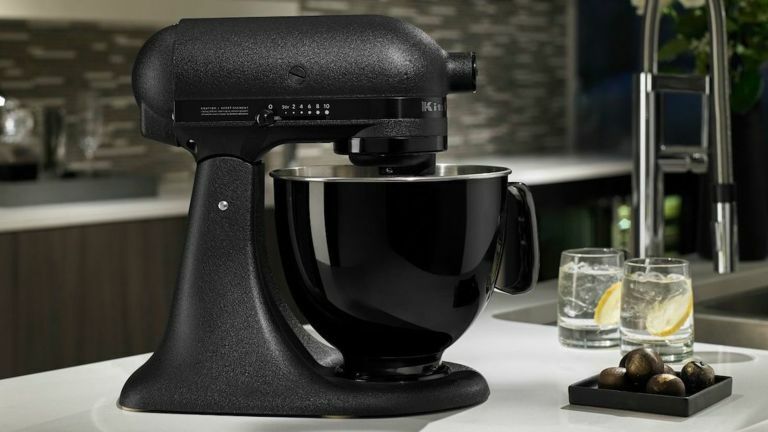 The KitchenAid Artisan Black Tie Limited Edition Stand Mixer is made with dashing all-black finishes and luxury materials, including die cast zinc, satin and black chrome. This countertop-dwelling beauty comes with a black, 4.8L PVD coated stainless steel mixing bowl and hub, plus a range of all-black accessories and attachments. Use the 325W, 10-speed Artisan stand Mixer to make your own festive dough (cookies, bread, pizza), batters and cake mixes, as well as mince pie ice-cream, brandy butter meringues and other Santa-tempting treats. Those of you who work regularly on a laptop will know the how precious a gift a great one can be, especially if you’re lucky enough to receive the Microsoft Surface Laptop for Christmas. Slim and elegant, the tone-on-tone Surface Laptop with Windows 10 S is impressive inside and out. You’ll love its glorious 13.5-inch PixelSense display (201ppi) with touchscreen tech, and its Signature Alcantara covered keyboard and palmrest, treated to resist coffee and water spills and general food stains. Inside the Surface Laptop’s compact aluminium shell is Intel’s seventh-generation i5 processor, and 4GB RAM and 128GB SSD, giving you decent power and storage space. Use the laptop’s Turbo Boost feature and you can run multiple programs and nail various power-intensive tasks simultaneously without bringing your new laptop to a grinding halt. While that grass won’t mow itself, the Indego 400 Connect can certainly take on the job for you. Bosch’s new, super-smart robotic lawnmower is easy to use, making it an ideal gift for those who want a fuss-free way to maintain grassy gardens. The Indego 400 Connect features a handy mulching system that collects grass clippings, then distributes them evenly for fertilising and maintaining the health of your lawn. This compact robot mower is app-controlled, and you can either programme it in advance, setting up a rolling calendar of mowing and mulching activities, or you can control it on an ad-hoc basis via your smartphone. Also works as a last-ditch party trick for any Christmas gathering dying a slow death. Is it a bird? Is it a plane? No, it’s Parrot’s new FPV drone! Drones are designed for aerial exploration, but if you lack battery power you’ll be back on terra firma before you know it. Here to solve the battery life problem is Parrot’s nifty Bebop 2 Power Pack, which bundles a high-performance drone with a pair of high-capacity batteries for a staggering 60 minutes of flight time. Once airborne you can take full advantage of the drone’s onboard camera and 3-axis digital image stabilisation to shoot Full HD video or 14MP stills. A 2km range provides plenty of room to explore. Feeling creative? Intelligent Flight Modes encourage you to pull off epic shots, including 360-degree panoramas and the classic drone selfie. For even greater control over your quadcopter, Parrot’s immersive Cockpitglasses are the perfect tool to experience a first-hand perspective of each flight. The question is, do you have the guts to take the Bebop 2 up to its 65 kmph top speed? In FPV mode it’s the closest you’ll get to flying!